"The BBC were pretty disgusting throughout all of it. You only have to look at the time given to the candidates, you only have to look at the fact that in the majority of cases the last word was given to a No campaigner. The BBC backed that." Accusations of bias against the BBC were relentless during the referendum campaign and it appears the Yes camp are determined to keep that narrative running. So I thought I'd look into it. This presented an obvious challenge to the Yes campaign. There were similar issues with the Royal Family and the Pound. The Monarchy question was finessed by throwing a net over the Republicans in the Yes camp and saying "Scotland will be a constitutional monarchy for as long as the people of Scotland wish us to be so". The currency question was to prove trickier; the best they could come up with was to adopt the (legally incorrect and ultimately unsuccessful) position of "it’s our pound and we’re keeping it". But what to do about the BBC? As Severin Carrell said in the Guardian: "The national broadcaster is identified by critics of independence as a great unifier for the UK's nations and regions, an institution that helps bind Britain's citizens into a common family." More pragmatically it could be argued that we could rely on the BBC to carry out the sort of thorough, impartial journalistic scrutiny that might expose any gaps in the SNP's economic case. Isn't that interesting? He trusts the BBC to be impeccably balanced in any circumstances other than the one where he himself has the most extreme reason to be biased. So the Yes campaign adopted a very straightforward strategy: consistently accuse the BBC of failing to be impartial and impugn the integrity of any journalist who asks difficult questions or highlights weaknesses in their arguments. Cry foul frequently and loudly enough and you’re half way there. Well 45% of the way there as it turns out but you get my point. 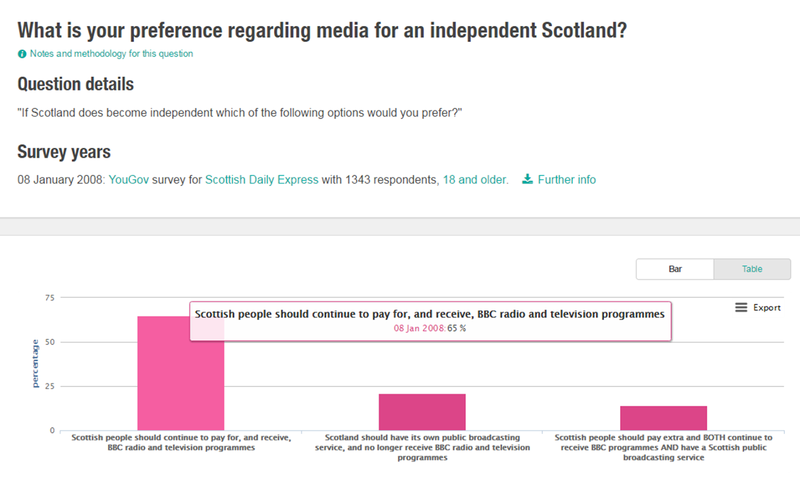 Now none of this is to say that the BBC may not have been actually biased (we're coming to that); but it is to argue that the Yes campaign were - how to put this? - predisposed to find reasons to accuse the BBC of bias. Of course this approach wasn't restricted to the BBC; take this interview with Sky News after the second TV debate. The interviewer is doing the job of a good journalist, questioning Salmond reasonably and firmly on his currency assertions (which I think most people agree deserved to be challenged). He reacts with spectacular petulance and ill-grace, resorting almost immediately to “you can’t play at being Alastair Darling” then - clearly stunned by the impertinence of an interviewer still pressing him for an answer - “you cannot now impersonate the No campaign” before eventually resorting to condescension: “get with the debate man”. It's only 3 minutes long - worth watching if you missed it at the time. Arguing that any interviewer pressing him was tantamount to them working for Better Together - if you think about it an outrageously insulting thing to say to a journalist - became a standard tactic of Salmond's. Which brings us to the now infamous press conference spat with the BBC's political editor Nick Robinson of the BBC. I promise this is the last anecdotal example before we look at more rigorous attempts to decide if bias existed - but the profile of this incident was so high it can't be ignored. If you're curious these YouTube clips show the actual "evidence"
In Salmond's response he airily dismisses the second question: “I think the people of Scotland have moved beyond these warnings and scaremongerings”, suggests some of the warnings were recycled from months ago (so this was in effect old news) before then addressing at length the specifics of the first (RBS relocation) question. He also throws in a few digs at the BBC which - rather unusually for a press conference - are greeted with ripples of applause. This was explained by the Huffington post: "Alex Salmond has been accused of "surrounding himself with Yes men" after hosting an "international press conference" where audience members clapped him as he responded to questions [...] The Yes Scotland pro-independence campaign admitted that "a small number" of supporters had been invited along with around 200 journalists"
Nick Robinson presses him to answer the second question but he simply repeats his answer to the first question and then (maybe not unreasonably) accuses Nick Robinson of heckling him. Now the question broadcast wasn't the best question a journalist has ever asked - it was really a rhetorical question posed to make a point rather than elicit a response - but the viewer can surely judge that for themselves. I've watched this several times and I think it's true (albeit hardly surprising) that Salmond didn't really attempt to answer the question broadcast. Whilst I doubt there will be any Pulitzer Prize nominations heading Nick Robinson's way for this particular piece of reportage, surely only the most hyper-sensitive politician could take serious offense at this 23 second news clip. Or a politician hell-bent on calling foul against the BBC at every opportunity. You know the rest of course – extreme offence was taken, the outrage and grievance machine was set into motion. 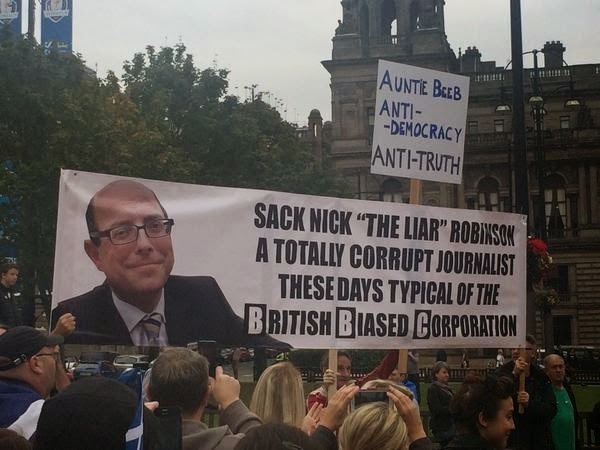 Within a week protests were held outside the BBC with a massive printed banner calling for Nick Robinson to be sacked. As reported in the Guardian , Alex Salmond backed the protests against Nick Robinson saying the BBC had been “unfair and unreasonable” in the way it edited the exchange. The Guardian went on to report: “BBC sources disclosed that some political reporters have been repeatedly subjected to verbal and online abuse [...] Paul Holleran, the NUJ's Scottish regional organiser, said there had been an escalating series of incidents in which journalists in Edinburgh and Aberdeen had been abused [...] Alistair Carmichael, the Scottish secretary [ NUJ], urged Salmond to call the protests off. "These are serious, serious tactics to be adopted and really, the person who could stop it all and pull the heat out of this is Alex Salmond. But time after time, despite every invitation to do so, he just ignores it". You might think Salmond's reaction was more likely to be "job done"; of course he didn't try to stop it. As reported by the Telegraph he escalated the situation by subsequently saying to Allegra Stratton (political editor of Newsnight): “You should have taken Alistair Darling’s place. You are doing much better than he did”. You might not be surprised to read that this was in response to Ms Stratton pressing him on the currency question. The Yes campaign were nothing if not consistent in their tactics. So let's step back a moment – Thousands of hours of news broadcasting, journalists working to tight deadlines and reporters and editors required to distill down lengthy exchanges into 30 second snippets (whilst providing a narrative commentary) and the 23 second news report by Nick Robinson is enough to create this level of backlash? Is this really the case for the prosecution? "Yes, absolutely," he says. "Of course it is. The problem with Nick … I mean, don't get me wrong, I like these folk, but they don't realise they're biased. It's the unconscious bias which is the most extraordinary thing of all. Take note: he’s not complaining about a specific incident or a specific journalist; he’s saying that “absolutely”, “of course” the BBC’s referendum coverage was biased. In the quote at the beginning of this piece he accuses the BBC of behaving like a “state broadcaster”. For the faithful followers of the Independence cause this is a self-evident truth, an article of faith; to question whether or not it was actually the case is considered heretical . Trust me I know this. I’m sure I could find plenty of examples where I could – were I to adopt the mind-set of a petty grievance-hunter – pick issues with the BBC’s reporting and argue that there were occasions where the No campaign was unfairly represented. We could look at the airtime given to Business for Scotland; look how weakly presented the economic arguments were in Robert Peston's documentary; question the failure to pick up on the £8.3bn lie Salmond repeated in both live TV debates; challenge the failure to follow-up on the obfuscation and susbsequent back-tracking on the one-off cost of independence. But I won’t because I recognise that there will always be occasions where one side feels hard done by; that individual journalists are human beings not automata and that a degree of journalistic judgement is applied in the reporting of any political story. There are 2,000 BBC news journalists; they will have differing opinions and will inevitably apply some of their own spin to stories. The question is not whether there is ever any bias - there will surely inevitably be some from time-to-time - the question is whether it is systematically in one direction or another. So here we turn to assertions like Ken Stott's "you only have to look at the fact that in the majority of cases the last word was given to a No campaigner" which - if true - would suggest there was indeed systematic bias. It would be interesting to know how Stott justifies asserting this as fact - there is no further source given in the Scotsman piece (that itself cites a Radio Times interview). I appeared on a few BBC Shows (Radio Scotland’s Morning Call and a couple of John Beattie shows, Radio 4’s "Voter’s Voice" and BBC Breakfast News) and they were scrupulously balanced with presenters clearly trying to balance each side’s airtime and alternating who got the last word. But of course this might be confirmation bias - I'm seeing the balance I hope to see and if the BBC's accusers are right I'm unlikely to think differently. So where's the evidence to back the claims against the BBC? 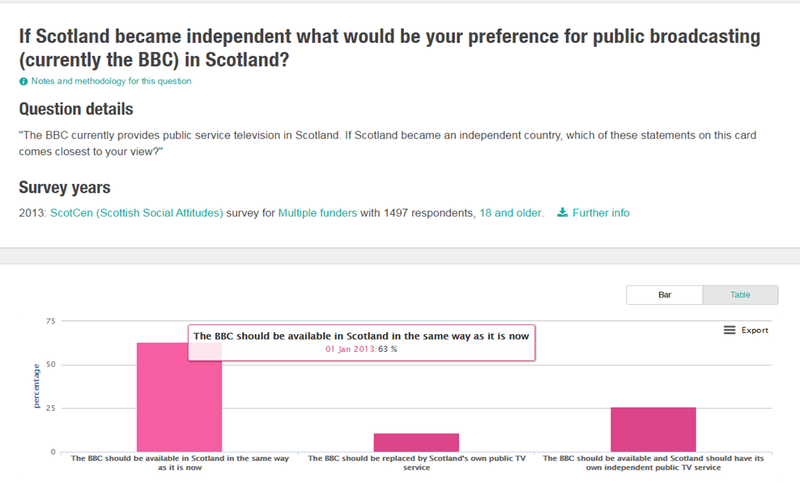 In a strongly worded online piece published in January 2014 Derek Bateman stated: "The effect, as proved by the research, is the same…the public, a majority of whom have lost trust in the BBC, can now accurately say that the BBC is biased against independence". Derek describes himself in the article as a "recent long-term employee"; the reader can judge whether there may be some bitterness behind his post. He admits "I can’t find a copy of the actual report " but is confident enough to say the case is "proved" and those who have lost trust in the BBC can "accurately say" the BBC is biased against independence. If he was still an employee of the BBC one wonders if he would make such bold assertions without having read report the in question. The report may not have been available when he wrote the piece but it certainly is now: there were two main phases to the work (Bateman was writing after the first) and in my search for analytical support to the question of bias in the BBC's reporting all the examples I found (eg. Open Democracy, MediaLens, The Conversation) lead point back to this same study. The work was sponsored by the Yes campaigning website Newsnetscotland.com and carried out at the Creative Futures Institute of the University of the West of Scotland by Dr John Roberston (who according to the Guardian "favours independence"). It would seem prudent be wary of the risk of some confirmation bias here. Let's look at Ken Stott's assertion that "in the majority of cases the last word was given to a No campaigner". 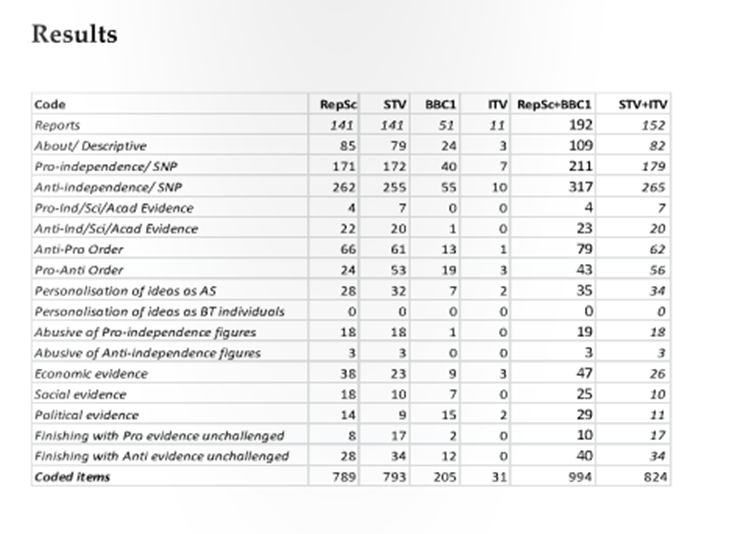 Looking at "anti-pro" vs "pro-anti" order for BBC output (BBC1 + Reporting Scotland) the analysis shows that pro (pro Independence) was the second argument 79 times versus 43. 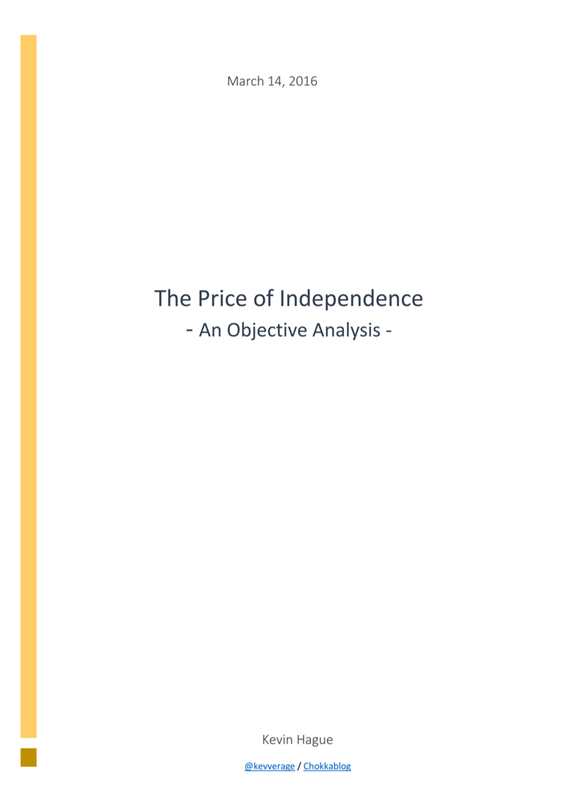 The narrative provided by the report suggests "this tends to normalise the No/anti-independence position and put the onus of the Yes/pro-independence position to justify itself". Well forgive me but that's as clear a confirmation bias spin as you can imagine - as Mr Stott highlights having the last word is generally seen as an advantage in theses situations; the data shows that Yes had the last word more often. I think we can safely assume that had the data been reversed we would have seen that alternative argument deployed. But what about finishing with "Anti-evidence unchallenged" out-weighing finishing with "pro-evidence unchallenged" by a ratio of 4;1 (40 vs 10)? Well the definition used is "finishing a broadcast item with a clearly [pro or anti-] piece of evidence unchallenged. The word "clearly" in there may give us a clue as to the subjectivity that has been applied. There are 192 BBC reports analysed and only 50 are attributed as "clearly" finishing with one side's evidence unchallenged. I wonder if a different subjective assessment might decide some of those unclassified may finished with pro evidence unchallenged? The rest of the analysis frankly gets a bit silly as it's predicated on the assumption that there is an equal amount of anti vs pro news or anti vs pro evidence to report. It doesn't require the greatest intellectual leap to consider that it's just possible there may have objectively been more anti evidence emerging. For example: the commentary states "Anti-independence statements were heavily concentrated on economic affairs such as alleged increased unemployment or closures after independence"; but if that was the news that was coming out - what the vast majority of economic experts and businesses were saying - it's hardly evidence of bias to report the fact. The report carries on in the same vein :"there was clear tendency to use anti-independence over pro-independence evidence. "; now I was pretty buried in the data and - to be frank - when it came to evidence there was simply a lot more anti-independence evidence than there was pro. The job of the Yes campaign was to find or generate pro economic evidence- it was hardly the BBC's fault that the Yes campaign couldn't produce evidence in favour of their economic assertions. Maybe it's easier to look at the current news to illustrate this point; the falling oil price is clearly anti the economic case for independence - to suggest that shouldn't be reported unless there is some balancing pro economic news is patently ludicrous. This analysis would, however, suggest that to simply report this news would be evidecne of vias. Similar argument apply to the "personalisation" judgements which are described in the text as "a heavy personalisation of the debate around the character of Alex Salmond". That is surely a function of how the campaigns were run and/or the nature of the personalities involved: who is being put forward, what speeches and photo-calls are being arranged, how are they behaving (see above). One could equally argue that this shows Alex Salmond was getting an unfair share of the limelight (or maybe the researchers arew implicitly suggesting that his personality was an electoral liability?). Of course to really test the research one would need to see the raw data (which reports and incidents were score how). As Newsnet Scotland reported, when the BBC formally asked Dr Robertson "we wonder if you might be willing to share that with us?" the good Doctor's response was clear: "No." Why on earth would you be unwilling to share your back-up data if the evidence for bias was so unequivocal? Enough on the first report - maybe if Derek Bateman had been able to read it he wouldn't have suggested his assertions were "proved" by the research - may be if Ken Stott had studied the data he wouldn't assert that in the majority of cases "the last word was given to a No campaigner". The research certainly doesn't back up either of these claims. 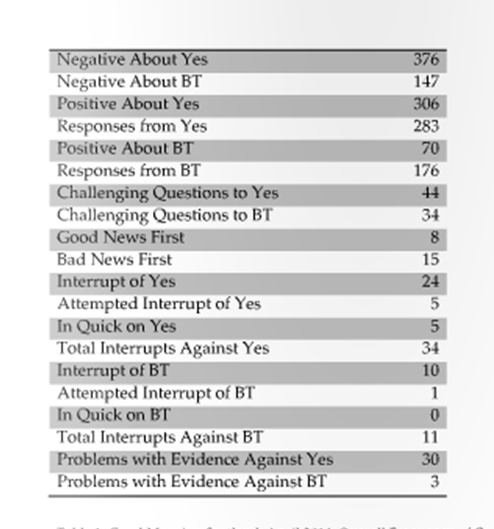 The commentary states: "it must be pointed out that no imbalance in the crude number of statements favourable to the Yes campaign and of those favourable to the Better Together (BT) campaign is evident in these results. Indeed we get a ratio favouring the Yes campaign 7:6". I love the phrase "must be pointed out" - the author is so disappointed at having to make that observation. But of cause the report's author is undaunted, carrying on to draw the conclusion that the broadcasts were "unfair to the Yes campaign and favourable to the Better Together campaign". Of course the argumentation for reaching that conclusion is built on the same obviously flawed assumption that to be fair, coverage must have equal positive and negative statements for each side, equal interruptions, equal good news / bad news stories appearing first. To offer a pragmatic example: if one side makes arguments that are error strewn or based on unsubstantiated assertion they probably deserve to be interrupted or challenged more than the other. That wouldn't be evidence of bias; it would be evidence of journalists doing their job. So I've looked long and hard - I've tried to be objective - and I certainly can't find anything to justify the rabble-rousing statements that are still emerging from the Yes camp. So how come the mud appears to be sticking? Whilst writing this blog post I've realised there is a powerful irony here. The organisation most damaged by Mainstream Media (MSM) bias is the BBC itself. It's hard for the BBC to defend itself (because "they would say that wouldn't they") and other MSM players (including the print media in an increasingly digital world) see the BBC as a major competitor. The people who it could be argued should be leaping to the BBC's defence are those who have most to gain from seeing the BBC weakened. It may not be coincidence that the most supportive MSM quote I used above is from a report in the Guardian - itself Trust owned and independent of any proprietorial influence. I don't imagine that the Murdoch press is losing any sleep over the beating that the BBC has been taking. Impressive piece of writing but wrong in the end. Just calling my analysis silly is a bit daft. Hope the "Prof"is subsequent to the study else apologies for referring to you as a mere Doc. I thought I did a little more than just accuse you of being silly - I attempted to justify why the methodology was flawed - but maybe I failed. It was a long blog post and I was weary. Overall, a wall of text that doesn't really clarify anything sorry. Choka! Well known for being a rabid unionist and hater of anyone and anything Yes.Hope the BBC paid you well in kind,they giving you a job or your own show called "l loathe working class"
I noticed Prof Robertson's posts on BBC bias during the campaign. One on the oddest things he did was accuse the IFS and OBR of bias in their projections on oil revenues without acknowledging that the OBR had overestimated oil revenues on a fairly consistent basis, having to subsequently revise down their figures as they came in. The implication however, as these were "ideologically unionist" organisations, was that they had done the opposite and had played down oil revenues for their own purpose. I am leaving aside the point that the IFS has shown no sign of caring about the referendum or having any position. Of course we can now guess that the scaremongering projections made by the OBR before the referendum are going to be have to revised down dramatically again. That does leave you wondering, given the omission of key facts, who is the more biased - the OBR or Prof Robertson? You could also wonder how he would approach other "contentious" issues - such as climate change. Would he expect "good news" stories ("Hey, its a hoax") and "bad news" ("This is a real problem") stories to be given equal weight? Is their any room for a news organisation attempting to filter based on their judgement of the quality of the story and the source - scientific community source vs loony tune deniers for instance? My point was that it was not a great question but the viewers could judge that for themselves therefore the reaction from the Yes camp was way over the top. Congratulations on this excellent piece of work. As a Scot resident in England (and based on what I saw on news and current affairs programmes), I felt that the BBC was about as impartial as it could possibly be in the circumstances. A view shared by a number of friends in this country and elsewhere. There was certainly no indication that the main SNP personalities were short-changed in terms of media exposure. Nick Robinson's challenge on currency etc was no different from what he does to many other politicians on a daily basis. I'm sure most of them don't much like it but they know it goes with the territory.Frankly, it's bizarre that an experienced politician like Mr. Salmond considered he should be immune from this line of questioning? My take as a Yes voter who is a little fed up of the most rabid sections of the '45'. Was the BBC biased? Not intentionally or controlled from above. Was there any bias? Almost certainly. Much of the leading figures of the BBC Scotland team were obviously anti-independence and many have strong political affiliations with unionist parties. They did a good job to keep that at bay mostly but it certainly crept through on a number of occasions. I think the figures for number of interruptions are a strong indicator for this. One thing I would say is that while I agree that the BBC had a duty to scrutinise the economics of the Yes campaign, I saw not a single objective analysis that suggested the economy in Scotland may be anything other than rosy under a no vote. No scrutiny whatsoever of the actual implications of voting No. Anywhere. The reason why there was no scrutiny of the implication to the economy of voting no was that there was none. It would be the status quo, the only implications come when things change, so the debate had to be on whether independence would make the economy better or worse. There was no active analysis required for nothing changing. A good few months on now and MPs criticised civil service conduct ahead of independence referendum relating the publishing the White Paper - using tax payers money - then just a few days later Alex Salmond is demanding that his Scottish Government should control the BBC in Scotland. I cant imagine anything worse as it would surely lead to a “day of reckoning” or fear of that forever. Necessary but inconvenient questioning could cease altogether. Almost more alarming is that I've not heard a single SNP voice raising any dissent against this outrageous demand of media control from a control freak. Neil O'Edinburgh: "Almost more alarming is that I've not heard a single SNP voice raising any dissent against this outrageous demand of media control from a control freak." It is actually against SNP party rules for any member to speak out publically against the official party line - they voted in favor of this rule at their last party conferance. Should say that I am indeed a yes voter, however as I've read in your bio I similarly am more interested in finding truths rather than adhering to party-lines or without evidence points of view. I've found reading some of your articles very engaging. Mostly well researched and, although very animated against my preference of governance, thought-provoking and certainly asking legitimate and tough questions. However (you knew it was coming), having read this one I feel you're playing into the, which you already identified, confirmation bias. Your rebuttal of the Nick Robinson affair is simply inadequate. Yes, he didn't answer his second question (that he sneeked in anyway) but Salmond (not my very guy by the way - or many yes voters favourite guy, most of us see the faults too) did answer a lengthy response to his previous question. Which covered similar ground. Not exactly. But similar areas were answered. Now, this was at an specifically International press conference. He had already given 7 or 8 minutes and moved on. Now with my inherent bias I see that as common sense. The press conference was called with the aim of reaching international audiences and he had to try and do that, whilst at the same time be polite and respectful to people such as Nick and the Beeb. With your inherent bias, you saw that as a smug disregard for Nick's second question and trying to shirk from response. Now, the main bit. The report. Now the question broadcast wasn't the best question a journalist has ever asked - it was really a rhetorical question posed to make a point rather than elicit a response - but the viewer can surely judge that for themselves. And that, in a nutshell, was what many reports felt like that. If you had confirmation bias towards that viewpoint, then hey, all good. But if you didn't, then the inherent bias' were obvious to see. Keep up the good work, even though we're looking at it from other sides of the fence. A month at Aberdeen journals and a stint reviewing music for The Skinny isn't quite the experience of an authentic "trained journalist"
No, you're right, I don't pretend to be a journalist. Somewhat lost faith in that game. However, I was merely referring to a degree in journalism. As a result, I've been trained in the principles of journalism. Those principles are at the core of the debate here I'm sure you'll agree (rather than my pedigree). When raking over the choices of a political journalist, the view of an experienced journalist seems more useful than the perceptions of a student who once wrote for a freesheet. As charming as you're coming across, perhaps it'd be more useful to debate the points made in the article (or my original comment for that matter). Or can only Senior Press Officers comment on controversial reporting? As someone who produces videos day in day out, I understand editing, and editing was the main issue with Nick's television report. But thanks for your contribution.